Silver Arrow Automobiles Private Limited - Service Provider of new cls, m class & four wheelers in Noida, Uttar Pradesh. Cleaner, more powerful and more economical: the new m-class features the latest blueefficiency diesel technology from mercedes-benz. Powerful and quiet, the engines also impress with their optimised emission and fuel-consumption figures, thanks to which they comply with the bharat stage iv equivalent emission norms. v6 engine. 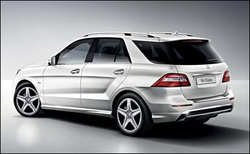 The ml 350 cdi blueefficiency 4matic also puts the emphasis on efficiency. Uprated and optimised for reduced fuel consumption, the v6 diesel engine develops 190kw/258hp@3600 rpm and an optimised turbo-charger combine to produce an immense peak torque of 619 nm@1600-2400 rpm. This translates into effortlessly superior pulling power in all driving situations accompanied by a reduced environmental impact and lower fuel consumption. furthermore, this engine has excellent quiet-running characteristics. The eco start/stop function ensures that the engine is switched off temporarily when the vehicle is stationary. A single glance is sufficient: your pulse accelerates from 0 to euphoria in a few seconds.The new SLK symbolises roadster genes and sports car evolution, progress with maturity,style and intensity. And the name Mercedes-Benz stands for the fact that it cuts just as fine a figure on the tarmac as it does in the eye of the beholder. It’s at home on the street. In its element in off-road terrain. There’s hardly another Mercedes-Benz that is so versatile and at the same time so superb in the disciplines of dynamism, ride comfort and handling safety, plus individuality. A true Mercedes. And yet so very different. The new A-Class will surprise you with its fresh, sporty design that blends emotive appeal with individualistic character and strikes a completely new note in the compact vehicle segment. The Mercedes-Benz design team was crowned "Team of the Year" in 2011 by a top-ranking jury of industry experts. With over 10 million c-class cars across the globe, mercedes-benz india launches the edition c that unveils a particularly sporty and stylish version of the c-class sedan. The artico/dinamica microfibre upholstery can be specified in black and combined with brushed aluminium trim. The dashboard, inside of the doors and carpets match the selected interior colour perfectly. The new-generation C-Class goes its own way simply because it can. Confident and captivating, with a striking, masculine exterior, sophisticated new interiors and state-of-the-art innovations. Powerful yet efficient engine options and 7G-TRONIC automatic transmission redefine performance unlike any other. The AVANTGARDE line lends the new E-Class a particularly sporty feel. The rectangular tailpipe trim in polished stainless steel integrated in the rear bumper and the front with the centrally-placed Mercedes star in the radiator grille as well as the sporty wing design with black diamond-pattern grille on the air intakes lend it a dynamic, distinctive, look. And matching these features, a host of aluminium trim elements lend the interior an active, sporty aspect. It’s at home on the street. In its element in off-road terrain. There’s hardly another Mercedes-Benz that is so versatile and at the same time so superb in the disciplines of dynamism, ride comfort and handling safety, plus individuality. Thanks to a series of pioneering assistance systems, and stylish equipment and appointments which set trends. 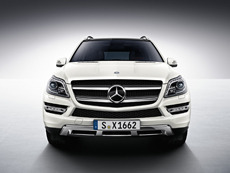 The new GL-Class is manufactured to the highest standard of automotive exclusivity. And has set itself the standard of living up to your highest standards.The result is the overall composition of relaxed locomotion and a visibly effortlessly superior ambition to lead: when a perfect day can be measured in kilometres driven. When size also means responsibility. When the forces of nature lose their horror, only then has the aim of the new GL-Class been achieved. he attractive covering of the SLS AMG conceals a package of innovative technology: an aluminum space frame chassis, an AMG 6.3-litre V8 rear-set front engine with dry sump lubrication, an AMG SPEEDSHIFT dual-clutch transmission with a Race Start function, an AMG sports suspension with aluminum double wishbone axles – this unusual combination guarantees dynamics on the highest level of sports cars and turns every journey into an experience. A maximum output of 420 kW (571 hp) and a maximum torque of 650 Nm accelerate the 1620 kg of the gullwing vehicle from zero to 100 km/h in 3.8 seconds. The electronically limited top speed is 317 km/h. Every Mercedes-Benz model car is an exact scaled-down replica of its real-life counterpart. Mercedes-Benz model cars are known for their fine detailing. The bodywork and interiors that characterise real life Mercedes-Benz vehicles are duplicated in the model cars. 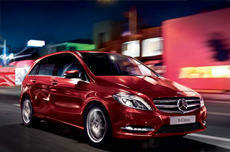 Mercedes-Benz India ushers in the New Year with much style, opulence and automotive magnificence. After a mega successful ‘Year of Offensive’, Mercedes-Benz now transitions into the ‘Year of Excellence’ with the launch of the ultimate luxury car– the all new S-Class. The new Mercedes-Benz S-Class thinks with and for you. On every trip technical assistance systems work unnoticed in the background to provide the highest levels of comfort and safety and to support the driver in traffic. First-Class office and wellness lounge in every seat. Courtesy of - amongst others - the extra-large displays, the Burmester® surround sound system and the Executive seat in the rear. The suspension gives the impression that you're floating above the tarmac. No place for pollutants in here - for ionised oxygen molecules clean the air and ensure a feeling of well-being. The latest generation of engines provide optimum power delivery with reduced emissions in the S-Class. Mercedes-Benz is one of the most reputed and sought after brand of cars. It stands out, amongst other attributes for being long lasting, reliable and safe! Mercedes-Benz Genuine Parts have been developed with these attributes in mind. The producers of counterfeit or fake parts, are not concerned with the safety of all road users or whether the part might damage the vehicle. They produce parts, such as brake pads, oil filters, air filters, windscreens as well as accessories like alloy wheels, from sub-standard materials for their own profit. They are deceiving unknowing customers by copying the look and design of Mercedes-Benz Genuine Parts - producing parts which might only last a short period of time, or jeopardise the safety of the car and its passengers. Amilies might not be able to plan everything, but they can count on anything happening. The new B-Class meets the demands that daily life has in store for you. Generous amounts of space demonstrate a great sense of order. The confident, sporty exterior and high-quality interior are stylish companions on every journey. Numerous assistance systems pamper you and ease the burden on you or help ensure safety. Efficient engines, combined with clever BlueEFFICIENCY measures, make being out on the road as harmless to the environment as possible. Because there’s no finer thing than a future. Because you are already thinking of tomorrow today. And because the next generation always has priority. 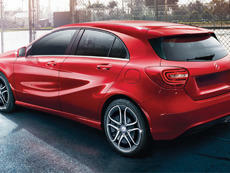 The new B-Class.